"Donald Trump has threatened to use funds allocated for disaster relief to fund his border wall. It's time to rethink how we frame disasters to stop politicians from using them for political gain." The Intergovernmental Panel on Climate Change (IPCC), the United Nations body tasked with providing governments with the most accurate and up-to-date scientific information upon which they can frame their policy-making, released a special report in October 2018. It called for a rapid net reduction in carbon dioxide emissions by 2030. This means there are fewer than 12 years remaining for these changes to be accomplished globally. Compounding these dire warnings are the potential consequences for severe catastrophic events as they unfold in a turbulent global environment, both physically and politically. The Trump administration’s recent release of the Fourth National Climate Assessment demonstrates just how costly climate change and catastrophic events will be for the United States in the future. Yet the administration and even President Donald Trump himself deny the existence and effects of climate change, including during increasingly severe events. But others are taking the consequences of climate change seriously, including the U.S. Department of Defense (DoD), which has been actively increasing its resilience. The DoD views climate change as a “threat multiplier” and has been working to integrate adaptation measures into its plans, operations and training both internally and in conjunction with external partners. Within this context, Trump’s recent government shutdown and the intractable disagreement over the border wall is misguided in the most charitable of terms. While the crisis over the shutdown appears to be over, at least for now, Trump has threatened to fund his border wall by taking money allocated for disaster relief and reconstruction. This includes $2.4 billion for California in the aftermath of its devastating wildfires and $2.5 billion to assist Puerto Rico’s recovery from Hurricane Maria. 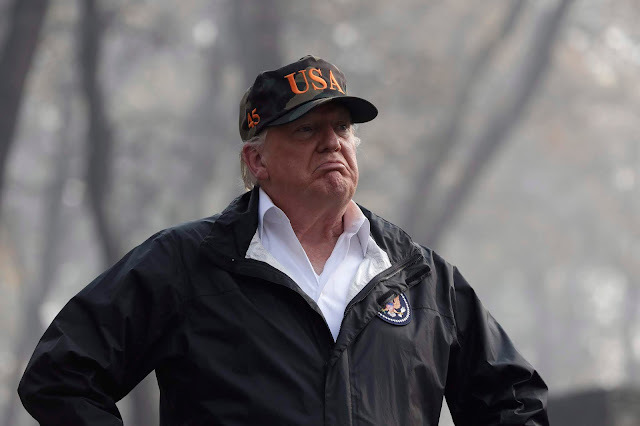 Trump’s rhetoric around the allocation of disaster relief funds, along with other disaster-related subjects, including death tolls, reveals just how easily disasters are politicized. They’re used for political gain almost always at the expense of those most vulnerable. That’s because politicians make politically expedient choices — in this case over funding a border wall — ahead of those that actually protect the security and safety of citizens in ongoing and future disasters. Most importantly, Trump’s threats illustrate why our discourse surrounding climate change and catastrophic events matters, and why it needs to change in order to reduce the impact of future disasters. Mainstream narratives of disasters present them as isolated events in both space and time, distinct from our everyday relationship with nature, and possessing a definite beginning, middle and end. These narratives generally focus on the physical hazard itself as opposed to the preconditions that actually result in disaster. When the flood or hurricane or forest fire is over, the thinking goes, our normal relationship with nature resumes until the next crisis occurs. This framing of disasters, and the policy prescriptions that follow from it, was first identified by Kenneth Hewitt in his 1983 work Interpretations of Calamity from the Viewpoint of Human Ecology. Hewitt’s observations about this mainstream framing — he called it the “dominant view” of disasters — was pivotal in the field of disaster studies. Scholars in the field, including Hewitt himself, started to argue for an expansive understanding of disasters that recognized the underlying aspects that determine the vulnerability of a community to specific hazards and risks, whether they’re natural or technological. Disasters are deeply connected to the economic, political and social factors that make people particularly vulnerable to them. While it’s convenient, for the purposes of media coverage or politicians, to understand them as having definitive beginnings, middles,, and ends, scholars have pointed out that viewing them this way is extremely problematic. Trump’s threat to raid funds allocated in the aftermath of 2018’s devastating disasters is part of these narratives. It must be understood as an explicitly political choice that negatively impedes the recovery of those communities for whom the funds were originally allocated. Making this choice would ultimately increase the vulnerability of those communities to future disasters. Understanding the consequences of Trump’s threats to reallocate funding to his border wall makes the political aspects of disasters more visible, especially when framed by the effects of climate change and its consequences. Disasters are not isolated and distinct events but rather ongoing processes. A better understanding of the relationship between disasters and their underlying causes encourages politicians to take steps to reduce vulnerability, both through the better allocation of funds for disaster mitigation, as well as by supporting social and economic development programs for vulnerable populations. In my own work, I have called for an explicit understanding of disasters as a form of violence, and recent events have helped exemplify the necessity to reframe our understanding of disasters in an intentionally political way. Trump’s threats to the citizens of California and Puerto Rico over his wall make the plight of the vulnerable visible and the political nature of disasters explicit. By challenging how we perceive and understand disasters, we can change the discussions surrounding them and pressure politicians to move away from making politically expedient choices at the expense of the vulnerable.